Hennessey Performance's Mustang Boss 302 roars and we have the video to prove it. Last weekend Hennessey Performance unveiled their Ford Mustang Boss 302. We gazed in awe at the 650hp American muscle masterpiece and have been aching to see it in action. The American tuning company has just released a new video of their Boss in action and it is quite impressive. The first thing you notice when the 2012 Hennessey Mustang Boss 302 takes off is its blistering noise followed by the mad screeching of its Pirelli P Zero Corsa tires. The factory Ford 5.0-liter V8 engine is complemented with an Eaton supercharger, making every one of its 650hp distinguishable from the exhaust. The video shows the Boss exhibiting its exhaust note, burning out its tires and running a solid quarter-mile. The Boss can sprint from 0-60mph in 3.9 seconds and can make a quarter-mile in 11.9 seconds at 124mph. Carbon fiber features help the Mustang move so quick. 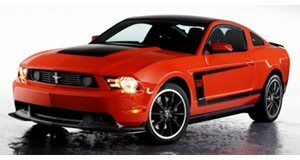 The Hennessey Ford Mustang Boss 302 package is priced at $15,995 and comes with a 3 year warranty.